Stay tuned for upcoming events for NYE YACHT PARTY in near future. 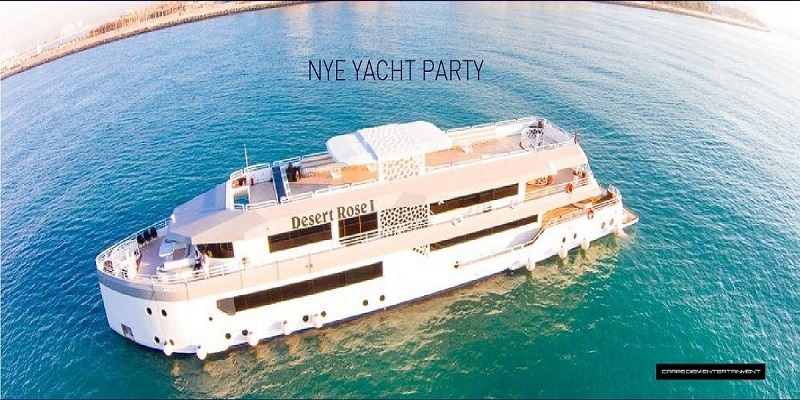 NYE YACHT PARTY by Carpe Diem Entertainment is organized to welcome the new year on 31 December 2016. Join us on this 6 hours (8pm-2am) mega event at Desert Rose Yacht departing from Pier 7, Dubai Marina for a one of a kind celebration. Doors open at 8:00 pm and the yacht sails at 9:30pm. Desert Rose Yacht is a luxury mega-yacht with lavishly designed custom built interiors. This 155ft yacht is ideal for large gatherings. It is a fully equipped boat with high end furnishings. Carpe Diem Entertainment is a privately owned Event Organizing & Management firm. Founded in Dubai in 2015, Carpe Diem organizes high quality events that aim to create special moments and facilitate social interactions. Carpe Diem values the clients needs and makes sure to customise perfect and unique experiences, whether it is to party, have your dream wedding, celebrate your birthday in style, present the corporate event of the year, and more. Terms & Conditions : **All purchases are nonrefundable. Best Viewed at 1024 x 768 pixels and above. This Page loaded in 0.02485 seconds on Fri, Apr 19, 2019 (07:03).